Jim grew up in a small lake town in the mountains of southern California, where wakeboarding taught him to be tough in the water. 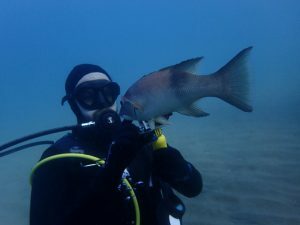 Jimmy learned to dive after he met Sarah in 2012, and after a close encounter with a giant black sea bass on a day trip to Catalina, he was hooked. Sarah and Jim became lifelong dive buddies in 2014. Jimmy enjoys the peacefulness of diving and learning new things about critters from Sarah. Jim completed his MBA at UC Davis in June 2017, and now works at a private equity consulting firm in Davis.